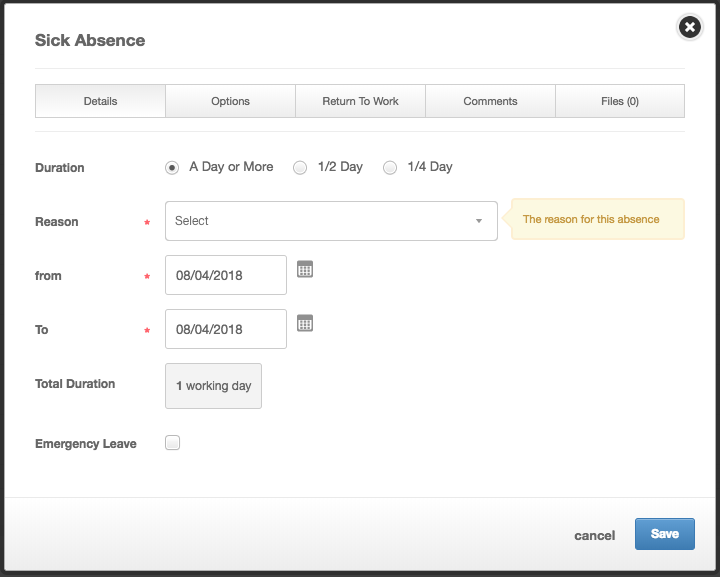 Admins and managers have the ability to record a sick day on an employee's record. 1. Go to an employees record and enter the planner. 2. Click on the relevant month you wish to add Sickness and select the appropriate day on the Sick line. 4. 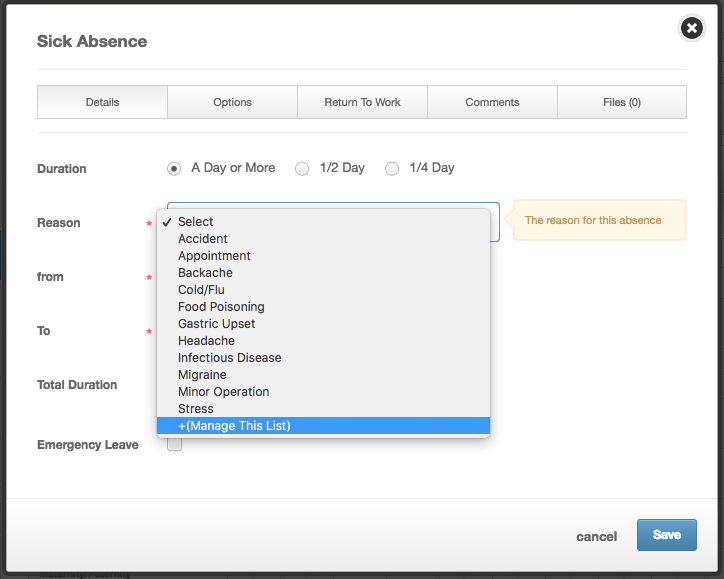 Select the appropriate sickness reason from the dropdown list. 6. Once you have selected the reason, enter the From and To dates. 7. Emergency Leave = This will simply reduce the employees holiday entitlement by the sick duration. This can only be selected by administrators. 8. 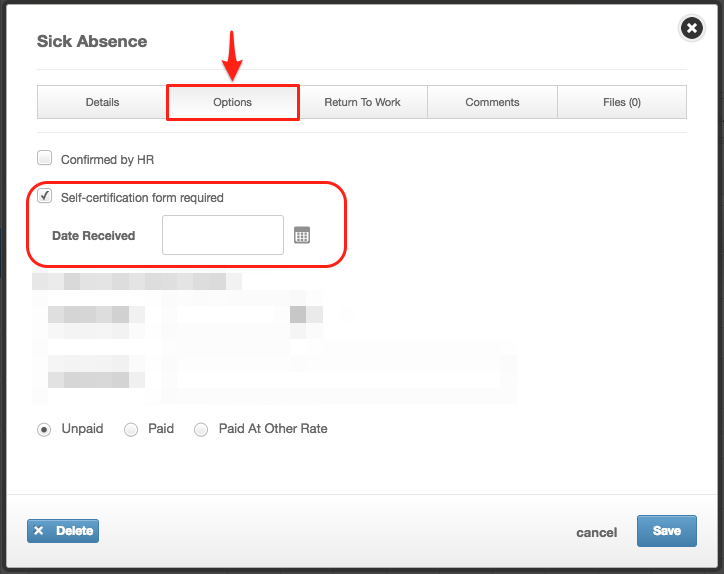 Next, in the 'Options' tab you can select if HR has confirmed the sickness, choose whether a back to work interview and self cert are required. Once received, enter the dates. 9. And finally enter any comments and add any relevant files to the record. 2. Select the specific reason you wish add a new reason, or click on the '+' icon to add a new one. 3. Tick if you wish for this to be 'In Use' or not. If not, this reason will not be displayed on the list. 4. Specify the name of the Absence Reason. Manager Review Required - Select if a back to work interview is required. This interview would be conducted at work, and you can then input the date this took place and who it was conducted by. Certificate Required - If the type of sickness requires a self-certification/a doctor's note. An employee will give this to you on their return, you can either file this externally or store it in the sickness under the 'Files' tab. You will need to date the day in which you received this. 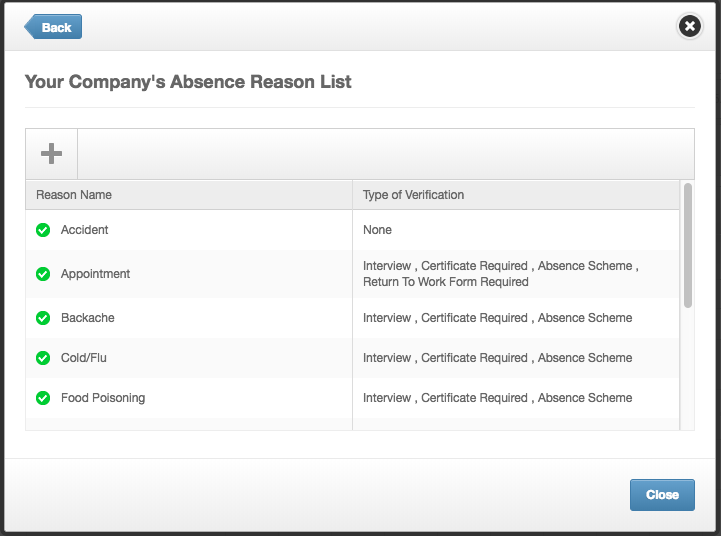 Include in Absence Scheme - Sicknesses that are only included in the absence scheme will be the only sicknesses that effect the Bradford Factor Score.You have the option to select which types of sicknesses are included in the Bradford factor scheme so that if an employee has been off sick for a while, for a major operation for example, they do not face a dismissal due to a high Bradford factor score. Return to Work Form Required - Emails will still be sent out prompting the manager for a Return to Work Form (as this needs to be completed within the system by both the manager and employee). 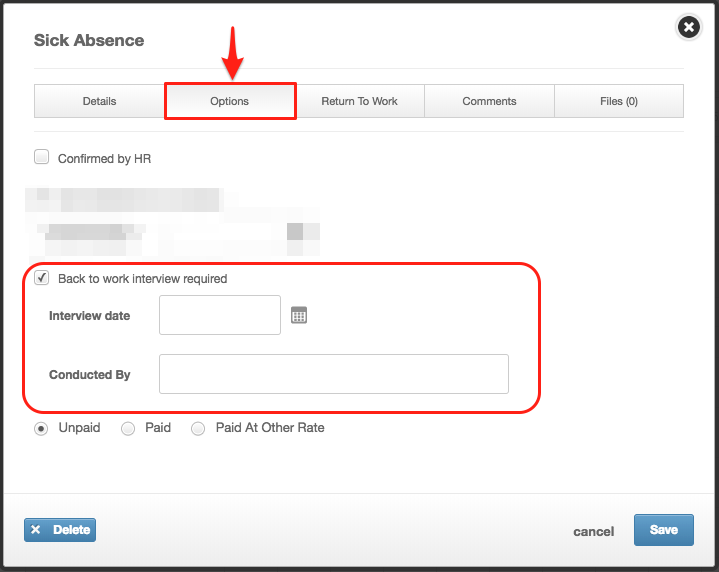 If you select for a Return To Work Form required, alerts will keep sending until this electronic form is filled out. If you use your own form, we do not advise selecting this option. 6. 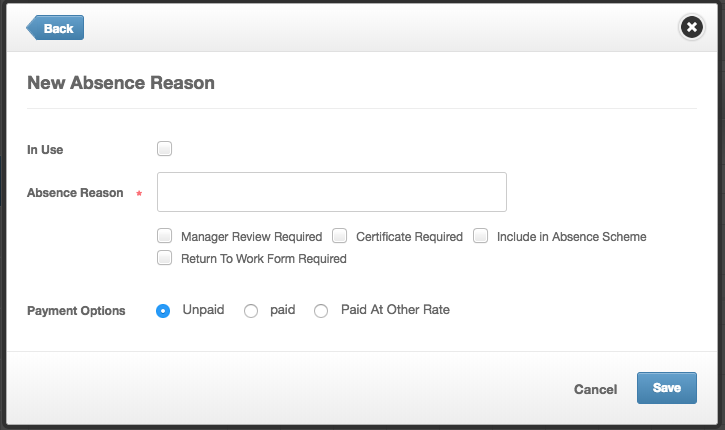 As an administrator, you can specify whether the sick is 'Paid', 'Unpaid' or 'Paid at another rate' for each sick reason too (this can also be manually changed for each sick instance if required). 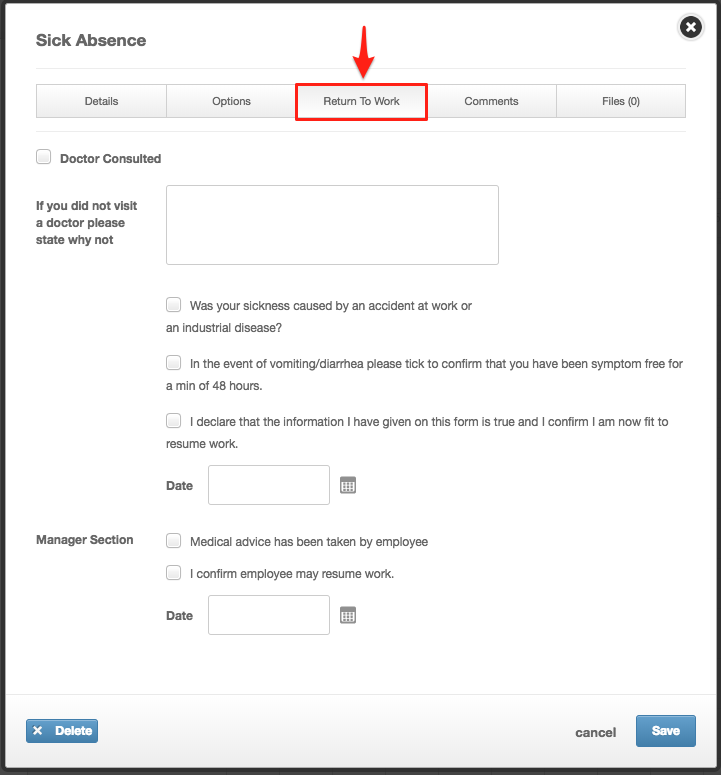 You also have the ability to add a sickness to an employee’s record from the mobile app.